“Anything perceived has a cause. One of the first principles we learn as babies is that of cause and effect. Infants learn that pushing an object will cause it to move, crying will cause people to give them attention, and bumping into something will cause pain. As we get older, this understanding becomes more complex. Many people love to talk about the causes of significant events in their lives (if I hadn’t missed the bus that day I would never have met my partner! or if I hadn’t taken that class in college I would never have discovered my passion and got my job!) Likewise, when something bad happens we have a tendency to look for somewhere to pin the blame. The mental model of proximate vs root causes is a more advanced version of this reasoning, which involves looking beyond what appears to be the cause and finding the real cause. As a higher form of understanding, it is useful for creative and innovative thinking. It can also help us to solve problems, rather than relying on band-aid solutions. Much of our understanding of cause and effect comes from Isaac Newton. His work examined how forces lead to motion and other effects. Newton’s laws explain how a body remains stationary unless a force acts upon it. From this, we can take a cause to be whatever causes something to happen. For example, someone might ask: Why did I lose my job? Proximate cause: the company was experiencing financial difficulties and could not continue to pay all its employees. Root cause: I was not of particular value to the company and they could survive easily without me. This can then be explored further: Why was I not of value to the company? Ultimate cause: I allowed my learning to stagnate and did not seek constant improvement. I continued doing the same as I had been for years which did not help the company progress. Even further: Newer employees were of more value because they had more up-to-date knowledge and could help the company progress. This can then help us to find solutions: How can I prevent this from happening again? Answer: In future jobs, I can continually aim to learn more, keep to date with industry advancements, read new books on the topic and bring creative insights to my work. I will know this is working if I find myself receiving increasing amounts of responsibility and being promoted to higher roles. This example illustrates the usefulness of this line of thinking. If our hypothetical person went with the proximate cause, they would walk away feeling nothing but annoyance at the company which fired them. By establishing the root causes, they can mitigate the risk of the same thing happening in the future. There are a number of relevant factors which we must take into account when figuring out root causes. These are known as predisposing factors and can be used to prevent a future repeat of an unwanted occurrence. The factors which prevented it from being more severe. Looking at proximate vs root causes is a form of abductive reasoning- a process used to unearth simple, probable explanations. We can use it in conjunction with philosophical razors (such as Occam’s and Hanlon’s) to make smart decisions and choices. Root cause is that most basic reason for an undesirable condition or problem which, if eliminated or corrected, would have prevented it from existing or occurring. Ignorance of remote causes disposeth men to attribute all events to the causes immediate and instrumental: for these are all the causes they perceive…Anxiety for the future time disposeth men to inquire into the causes of things: because the knowledge of them maketh men the better able to order the present to their best advantage. Curiosity, or love of the knowledge of causes, draws a man from consideration of the effect to seek the cause; and again, the cause of that cause; till of necessity he must come to this thought at last that there is some cause whereof there is no former cause. It were infinite for the law to consider the causes of causes, and their impulsions one of another; therefore it contented itself with the immediate cause, and judgeth of acts by that, without looking to any further degree. The issue with root cause analysis is that it can lead to oversimplification and it is rare for there to be one single root cause. It can also lead us to go too far (as George Orwell illustrates.) Over emphasising root causes is common among depressed people who end up seeing their existence as the cause of all their problems. As a consequence, suicide can seem like a solution (although it is the exact opposite.) The same can occur after a relationship ends, as people imagine their personality and nature to be the cause. To use this mental model in an effective manner, we must avoid letting it lead to self blame or negative thought spirals. When using it to examine our lives, it is best to only do so with a qualified therapist, rather than while ruminating in bed late at night. Finding root causes should be done with the future in mind, not for dwelling on past issues. Expert root cause analysts use it to prevent further problems and create innovative solutions. We can do the same in our own lives and work. This technique is simpler and less structured than Socratic questioning. Parents of young children will no doubt be familiar with this process, which necessitates asking ‘why?’ five times to a given statement. The purpose is to understand cause and effect relationships, leading to the root causes. Five is generally the necessary number of repetitions required. Each question is based on the previous answer, not the initial statement. Returning to the example of our hypothetical laid off employee (mentioned in the introduction), we can see how this technique works. Effect: I lost my job. Why? Because I was not valuable enough to the company and they could let me go without it causing any problems. Why? Because a newer employee in my department was getting far more done and having more creative ideas than me. Why? Because I had allowed my learning to stagnate and stopped keeping up with industry developments. I continued doing what I have for years because I thought it was effective. Why? Because I only received encouraging feedback from people higher up in the company, and even when I knew my work was substandard, they avoided mentioning it. Why? Because whenever I received negative feedback in the past, I got angry and defensive. After a few occurrences of this, I was left to keep doing work which was not of much use. Then, when the company began to experience financial difficulties, firing me was the practical choice. Solution: In future jobs, I must learn to be responsive to feedback, aim to keep learning and make myself valuable. I can also request regular updates on my performance. To avoid becoming angry when I receive negative feedback, I can try meditating during breaks to stay calmer at work. As this example illustrates, the 5 whys technique is useful for drawing out root causes and finding solutions. Cause: flammable grease on escalators. Research found that this was indeed highly flammable. Solving this would have been almost impossible- the sheer size of stations and the numbers of people passing through them made thorough cleaning difficult. Solving this alone would not have been sufficient. Cause: wooden escalators. Soon after the fire, stations began replacing these with metal (although it took until 2014 for the entire Underground network to replace every single one. Cause: untrained staff. This was established to be the root cause. Even if the other factors were resolved, the lack of staff training or access to fire fighting equipment still left a high risk of another fatal incident. Investigations found that staff were only instructed to call the Fire Brigade once a fire was out of control, most had no training and little ability to communicate with each other. Once this root cause was found, it could be dealt with. Staff were given improved emergency training and better radio tools for communicating. Heat detectors and sprinklers were fitted in stations. From this example, we can see how useful finding root causes is. The lack of staff training was the root cause, while the other factors were proximate causes which contributed. From this information, we can create this diagram to illustrate the relationship between causes. Hanlon’s Razor — This mental model states: never attribute to malice that which can be attributed to incompetence. It is relevant when looking for root causes. Take the aforementioned example of the Kings Cross fire. It could be assumed that staff failed to control the fire due to malice. However, we can be 99% certain that their failure to act was due to incompetence (the result of poor training and miscommunication.) 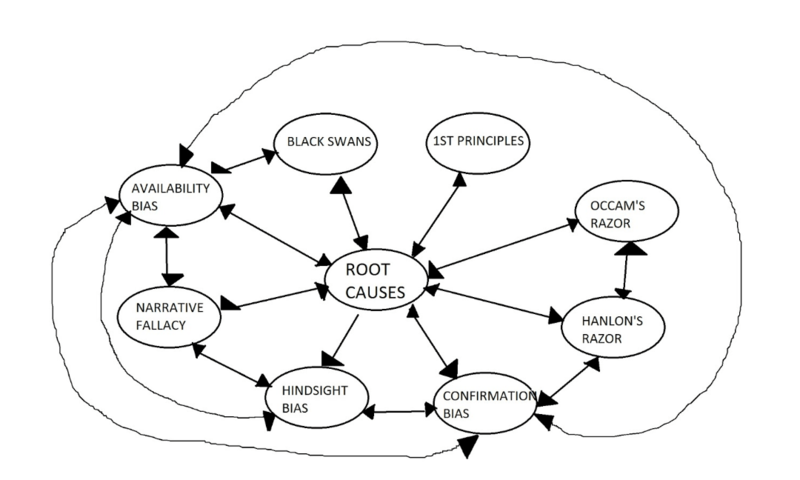 When analysing root causes, we must be sure not to attribute blame where it does not exist. Occam’s Razor — This model states: the simplest solution is usually correct. In the case of the fire, there are infinite possible causes which could be investigated. It could be said that the fire was started on purpose, the builders of the station made it flammable on purpose so they would be required to rebuild it that the whole thing is a conspiracy theory and people actually died in an alternate manner. 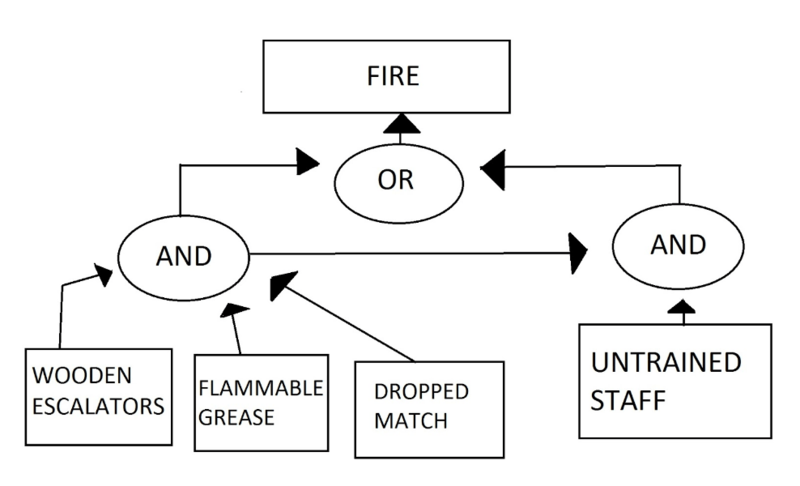 However, the simplest solution is that the fire was caused by a discarded match. When looking for root causes, it is wise to first consider the simplest potential causes, rather than looking at everything which could have contributed. Arguing from first principles — This mental model involves establishing the first principles of any given area of knowledge- information which cannot be deduced from anything else. 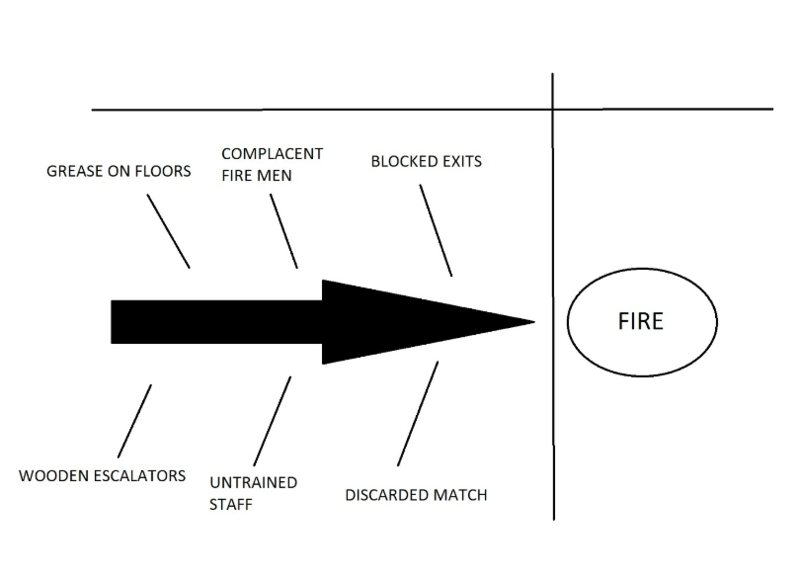 Understanding the first principles of how fire spreads (such as the fire triangle) could have helped to prevent the event. Black swans — This model, developed by Nassim Taleb is: “an event with the following three attributes. First, it is an outlier, as it lies outside the realm of regular expectations because nothing in the past can convincingly point to its possibility. Second, it carries an extreme impact…. Third, in spite of its outlier status, human nature makes us concoct explanations for its occurrence after the fact, making it explainable and predictable.” The King’s Cross fire was a black swan- surprising, impactful and much analyzed afterwards. Understanding that black swans do occur can help us to plan for serious events before they happen. Availability bias — This model states: we misjudge the frequency of events which have happened recently and information which is vivid. Imagine a survivor of the Kings Cross fire who had also been on a derailed train a few months earlier. The intensity of the two memories would be likely to lead them to see travelling on the Underground as dangerous. However, this is not the case – only one in 300 million journeys experience issues (much safer than driving.) When devising root causes, we must be sure to consider all information, not just that which comes to mind with ease. Narrative fallacy — This model states: we tend to turn the past into a narrative, imagining events as fitting together in a manner which is usually false. Hindsight bias — This model states: we see events as predictable when looking back on them. Confirmation bias — This model states: we tend to look for information which confirms pre-existing beliefs and ideas. Morality fascinates us. The stories we enjoy the most, whether fictional (as in novels, television shows, and movies) or real (as in journalism and historical accounts), are tales of good and evil. We want the good guys to be rewarded— and we really want to see the bad guys suffer. Even philosophers don’t agree on morality. In fact, a lot of people don’t believe in morality at all. A car full of teenagers drives slowly past an elderly woman waiting at a bus stop. One of the teenagers leans out the window and slaps the woman, knocking her down. They drive away laughing. Unless you are a psychopath, you will feel that the teenagers did something wrong. And it is a certain type of wrong. It isn’t a social gaffe like going around with your shirt inside out or a factual mistake like thinking that the sun revolves around the earth. It isn’t a violation of an arbitrary rule, such as moving a pawn three spaces forward in a chess game. And it isn’t a mistake in taste, like believing that the Matrix sequels were as good as the original. As a moral violation, it connects to certain emotions and desires. You might feel sympathy for the woman and anger at the teenagers; you might want to see them punished. They should feel bad about what they did; at the very least, they owe the woman an apology. If you were to suddenly remember that one of the teenagers was you, many years ago, you might feel guilt or shame. Punching someone in the face. Hitting someone is a very basic moral violation. Indeed, the philosopher and legal scholar John Mikhail has suggested that the act of intentionally striking someone without their permission— battery is the legal term —has a special immediate badness that all humans respond to. Here is a good candidate for a moral rule that transcends space and time: If you punch someone in the face, you’d better have a damn good reason for it. If you think of evolution solely in terms of “survival of the fittest” or “nature red in tooth and claw,” then such universals cannot be part of our natures. Since Darwin, though, we’ve come to see that evolution is far more subtle than a Malthusian struggle for existence. We now understand how the amoral force of natural selection might have instilled within us some of the foundation for moral thought and moral action. Actually, one aspect of morality , kindness to kin, has long been a no-brainer from an evolutionary point of view. The purest case here is a parent and a child: one doesn’t have to do sophisticated evolutionary modeling to see that the genes of parents who care for their children are more likely to spread through the population than those of parents who abandon or eat their children. We are also capable of acting kindly and generously toward those who are not blood relatives. At first, the evolutionary origin of this might seem obvious: clearly, we thrive by working together— in hunting, gathering, child care, and so on— and our social sentiments make this coordination possible. This creates a tragedy of the commons problem. But there is a wrinkle here; for society to flourish in this way, individuals have to refrain from taking advantage of others. A bad actor in a community of good people is the snake in the garden; it’s what the evolutionary biologist Richard Dawkins calls “subversion from within.” Such a snake would do best of all, reaping the benefits of cooperation without paying the costs. Now, it’s true that the world as a whole would be worse off if the demonic genes proliferated, but this is the problem, not the solution— natural selection is insensitive to considerations about “the world as a whole.” We need to explain what kept demonic genes from taking over the population, leaving us with a world of psychopaths. Darwin’s theory was that cooperative traits could prevail if societies containing individuals who worked together peacefully would tend to defeat other societies with less cooperative members— in other words, natural selection operating at the group, rather than individual, level. is that the good guys might punish the bad guys. That is, even without such conflict between groups, altruism could evolve if individuals were drawn to reward and interact with kind individuals and to punish— or at least shun —cheaters, thieves, thugs, free riders, and the like. there is a big difference between caring about a person (compassion) and putting yourself in the person’s shoes (empathy). How can we best understand our moral natures? Many would agree … that this is a question of theology, while others believe that morality is best understood through the insights of novelists, poets, and playwrights. Some prefer to approach morality from a philosophical perspective, looking not at what people think and how people act but at questions of normative ethics (roughly, how one should act) and metaethics (roughly, the nature of right and wrong). We can explore our moral natures using the same methods that we use to study other aspects of our mental life, such as language or perception or memory. We can look at moral reasoning across societies or explore how people differ within a single society— liberals versus conservatives in the United States, for instance. We can examine unusual cases, such as cold-blooded psychopaths. We might ask whether creatures such as chimpanzees have anything that we can view as morality, and we can look toward evolutionary biology to explore how a moral sense might have evolved. Social psychologists can explore how features of the environment encourage kindness or cruelty, and neuroscientists can look at the parts of the brain that are involved in moral reasoning. What are we born with? Bloom argues that Thomas Jefferson was right when he wrote in a letter to his friend Peter Carr: “The moral sense, or conscience, is as much a part of man as his leg or arm. It is given to all human beings in a stronger or weaker degree, as force of members is given them in a greater or less degree.” This view, that we have an ingrained moral sense, was shared by enlightenment philosophers of the Jefferson period, including Adam Smith. While Smith is best known for his book, An Inquiry into the Nature and Causes of the Wealth of Nations, he himself favored his first book: The Theory of Moral Sentiments. The pages contain insight into “the relationship between imagination and empathy, the limits of compassion, our urge to punish others’ wrongdoing,” and more. What aspects of morality are natural to us? Bloom argues that our goodness, however, is limited. This is perhaps best explained by Thomas Hobbes, who in 1651, argued that man “in the state of nature” is wicked and self-interested. that our moral judgments and moral actions are the product of neural mechanisms that we have no awareness of and no conscious control over. If this view of our moral natures were true, we would need to buck up and learn to live with it. But it is not true; it is refuted by everyday experience, by history, and by the science of developmental psychology. It turns out instead that the right theory of our moral lives has two parts. It starts with what we are born with, and this is surprisingly rich: babies are moral animals. But we are more than just babies. A critical part of our morality—so much of what makes us human—emerges over the course of human history and individual development. It is the product of our compassion, our imagination, and our magnificent capacity for reason. Still Curious? Just Babies: The Origins of Good and Evil goes on to explore some of the ways that Hobbes was right, among them: our indifference to strangers and our instinctive emotional responses.